I started as a traditional quilter but I have recently begun dabbling in more modern looking quilts. That is what I love about this art form. There is room at the table for everyone. I love both! 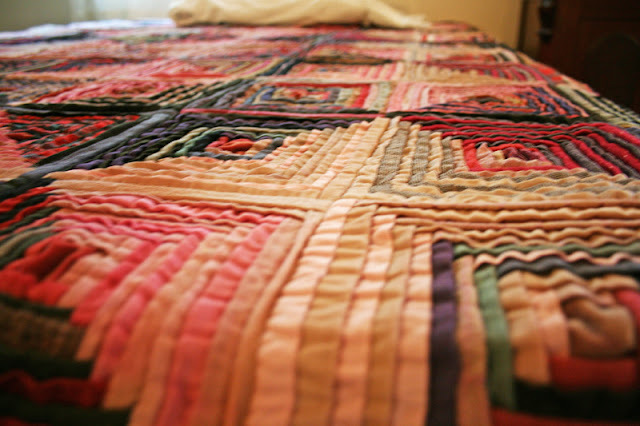 Todays vintage traditional quilts were probably made by the modern quilters of their day. It comes down to great design sense and creative use of color and fabric. I'm not much of a quilter these days but I really like a good variety of modern and traditional. I am traditional and modern's barren aunt that hovers around admiring their beautiful creations, in hopes that one day she too will be blessed to make such crafty things of her very own. I love traditional quilts (and have a few from my ancestors) but all the quilts I make a modern. So a nice mix! I love your definition b/c I am totally modern and traditional married and had kids. That is absolutely me. Love that first quilt too. Just today I saw a post from Marie BOstiwick that she posted April 9th on a technique that looks like that pleated quilt you showed. The post is titled Folded Courthouse square. As a quilter, I am in the middle. I like both quilting styles. I know exactly what you mean about the hand work. I love to hand quilt. It is so relaxing and rewarding when finished. I hope you have had a wonderful week!! I have thought quite a bit about this - I wasn't sure I wanted to join the local modern quilt guild because lots of the things that I like wouldn't be considered "modern." I have decided that I am "vintage modern." I love older quilt patterns and vintage looking fabric, but I think my stuff has a fresh modern feel too. My world views it a bit differently...pieced quilters vs. art quilters. It doesn't matter what colors, patterns or stitches you use, if you cut fabric apart only to sew it together again to be shared with others you love, you're a pieced quilter. If you create quilts that will only ever hang on walls as art, possibly using other mediums besides fabric and paint, you're an art quilter. I'm a "Vanessa kind of quilter"...love every single one of your quilts and can't wait to make the ruffle argyle quilt next!! I'm definitely an all-inclusive quilter. 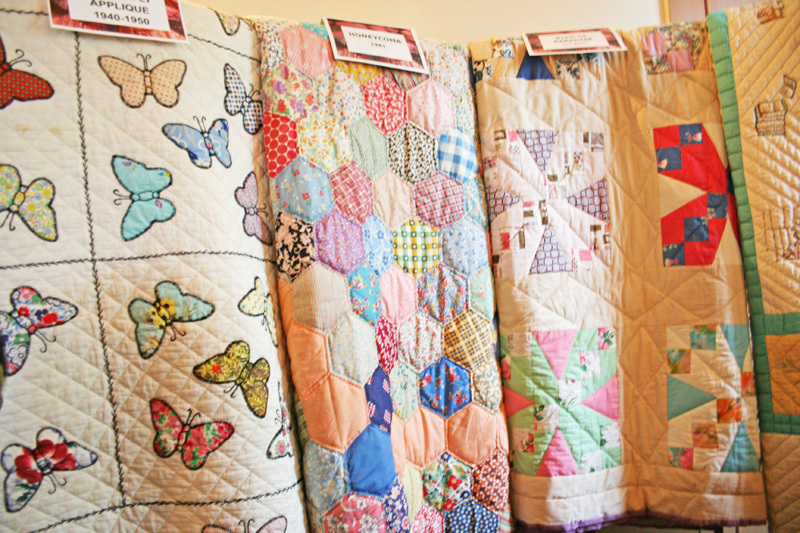 I love traditional 2-color quilts, all types of modern quilts, all sizes of quilts. 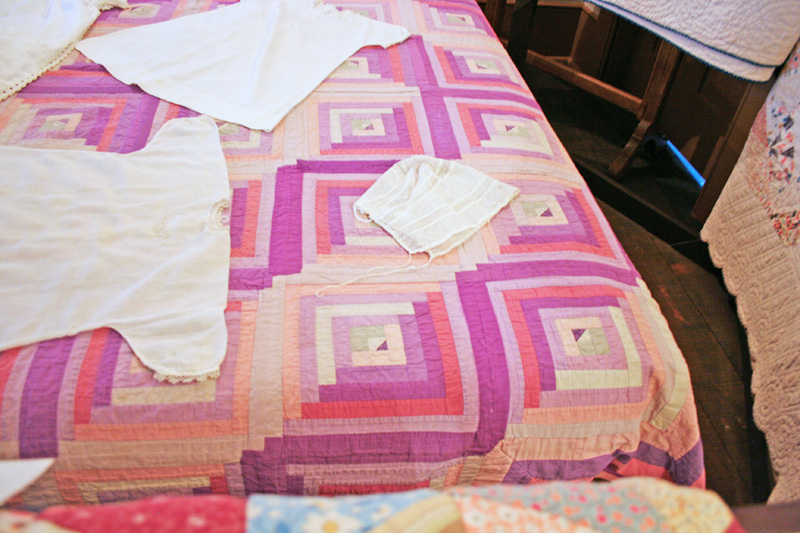 The clean look is my favorite, but I love to cuddle in a warrm and soft scrap quilt also. I have no idea what I am, I'm working on a disappearing 16 block atm, and planning a very modern looking plain colours quilt for my eldest; the first is probably quite traditional, the second not so much. If I ever actually FINISH a quilt, I'll let you know for sure! But, in the mean time, I would say I'm a mish-mosh quilter myself. I LOVE LOVE LOVE this post! You have hit the nail on the head. Quilt patterns haven't changed much, only our fabric choices (which can be trendy), and our piecing techniques! I'm definitely a traditionalist with a modern sassy twist! 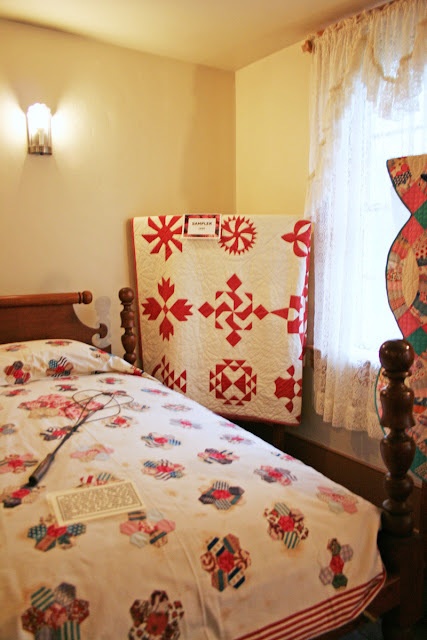 I love the log cabin with the folds -- I'm thinking ruffles or folds alternating directions... something with more movement like the thow pillow with frosting in your book. Love your ideas and keep it up! I appreciate the traditional quilts, but I really do love the modern/contemporary quilts. I love the vibrant colors, and the clean uncluttered look. It makes me happy! Married and had children, although you might think traditional to see my quilts. I love it all (well, almost)! Since I was there...I thought I should mention that you actually started tearing up when you saw one of those quilts!!! I thought, "Wow, you know you're with a quilting nerd when she is overcome and starts crying" It was nice of the docent to take down the rope and let you get up close and personal--it was a "special" moment-ha,ha! Started out really really traditional. Even thought art quilts were not really quilts. Go figure that. But then I made one, won a nice prize and a blue ribbon and have not stopped yet! I love it all. I do not quilt..but I did read this http://www.amazon.com/Quilts-Women-Mormon-Migrations-Transition/dp/1558533990 book once. (I think it was this one!! Seriously amazing!! Oooh, I've been wanting to go to Nauvoo for years -- you'd think as close as we are that we'd actually make that trip! I'm traditional + traditional got married and then had traditionaltraditional. Then modern + traditional got married and had moderntraditional. THEN those two children got married and had ME = traditionaltraditionalmoderntraditional! My style has evolved quite a bit in the last few years. Blogging has a lot to do with that. I love traditional with a modern twist, and bits of industrial thrown in. That first quilt has your name written all over it, it is so you! Quilt says it all no matter what type. When I started quilting seriously in 2000 I had some set ideas, but today anything goes. I am working my way through monochromatic, orange x2, green, brown, currently red. It really gives you some ideas of color. Hand appliqué is so soothing. PS the question in 2000 was to hand or machine quilt. A few years ago I would have said traditional all the way. Now I'm starting to loosen up and be more of that cross-marriage baby like you. V - I am a modern fabric kind of girl pieced into a traditional blocks. I love the meaning in the names of old blocks. I still like to see the art in a pieced quilt. I appreciate modern designs, but I like my Bear Paws and Dresden Plates. 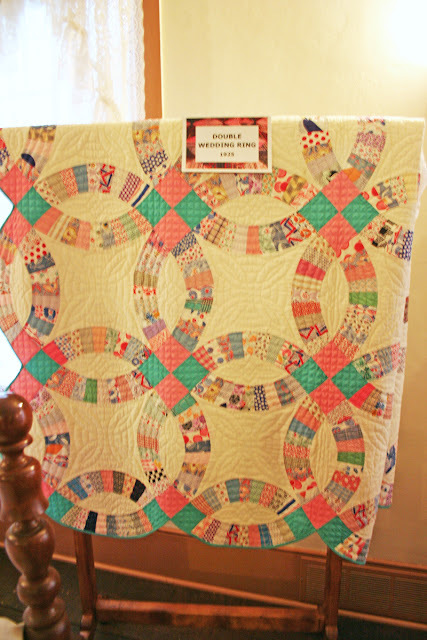 One of my favorite things about the trend of quilting lately is the traditional/modern mix. The quiet importance and attention to detail of the traditional and the unique non fussiness of the modern blend perfectly. That's why I love your quilts. Great inspiration for me.